Lock your doors. Surprisingly many of our burglary cases involve no forced entry. Access has been gained through unlocked doors, windows, pet doors or garage doors. Pay attention to unusual occurrences or activity. 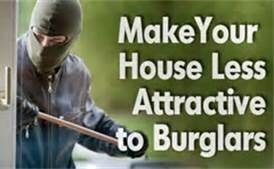 Most burglars are looking for a home where no one is home. Someone who knocks on your door and says they are selling something and yet they have no product should raise concern. The same for someone who says they are looking for someone who does not reside there. These are very common tactics used by burglars and police should be notified by the non-emergency number. Participate in your Neighborhood Watch program or assist in initiating one. This can be done through your local substation. Contact your local police substation Crime Prevention personnel who can provide more resources, including free home security surveys.